Mortgage Miser App Now Available! "Use Mortgage Miser to calculate the total cost of a Fixed-rate or 5/1 Adjustable Rate (ARM) mortgage. This app lets you see the total cost over the entire term of the mortgage. It's fun to play with, and you'll learn a lot just messing around with the numbers. If you're shopping for a Mortgage, it's not a bad app to have for quick questions like "How important is 0.25% less of an interest rate?" or "Why do I want a 20 year instead of a 30 year mortgage?" So I'm probably a bit biased here, but when you're proud of something simple, you like to tell people about it. 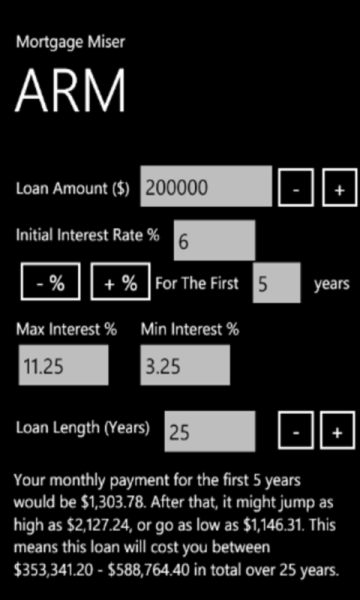 Mortgage Miser, my first Windows Phone 7 program, is now available in the Marketplace. It's free, and can be a fun tool to play with even if you're not in the buying-a-home mode at the moment. What's really interesting is seeing how the change of perhaps 0.25% can affect the total loan cost! So go grab the app, support the research of myself and my co-author (through ad impressions) and enjoy learning about the largest purchase you might ever make! Congrats Jon - it's a nice milestone.